By 2050, the majority of humanity will live in cities, towns, and other urban areas. Among the most pressing of global urban environmental challenges is air quality. In cities, the most damaging air pollutant is particulate matter (PM), but another pressing problem cities face is heat: the air is simply so hot in summer that human health is impacted. At the same time, with climate change, increasing temperatures around the world are exacerbating excess heat produced by cities and causing dangerous heat waves. To address this concern for the future, The Nature Conservancy (TNC) investigated the effect of planting trees in urban areas. The science is clear that tree leaves play a part in removing particulate matter from the atmosphere along with many other air pollutants. Also, the shade provided by urban trees along with the transpiration of water during photosynthesis can help reduce air temperatures, while also reducing electricity needed for residential cooling. From an economic perspective, TNC found planting trees produces a significant return on investment when planted strategically in certain areas of a city. To determine precisely where and how much trees can help, The Nature Conservancy collected geospatial information on forest and land cover, PM2.5 pollutant concentration, and population density for 245 cities and used relationships established in the literature to estimate the scope of current and future street trees needed to make urban air healthier. The resultant report, titled “Planting Healthy Air,” advises cities on where trees offer the highest return on investment for improving public health by addressing particulate matter and excess heat. To help visualize this data and share this story, TNC came to Blue Raster for help creating an interactive story map built on the latest Esri technology. 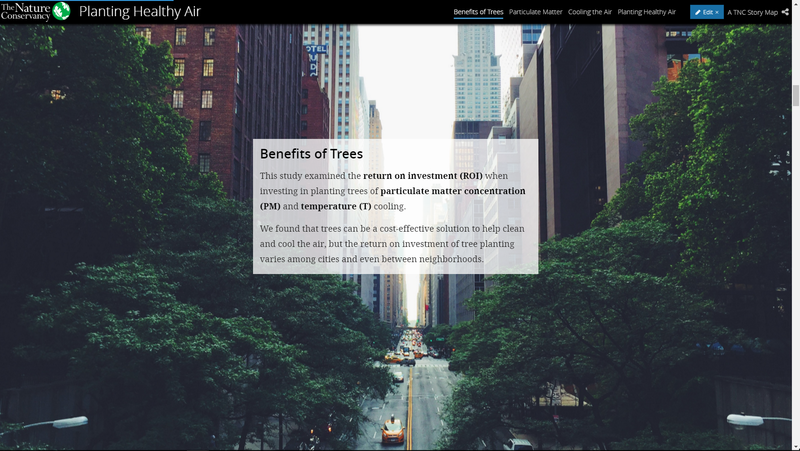 The Planting Healthy Air story map details the project’s motivation, visualizes its geographic data and geospatial analysis, and describes a simple plan for cities to reduce pollution and temperature by planting trees. The viewer can select a section of interest or scroll through all of them, exploring and interacting with maps. Viewers can see neighborhood-level analysis in any of the 245 cities included in the report or read in-depth remarks about one of 15 focus cities. Built on ArcGIS Online, the Planting Healthy Air story map uses Cascade, a new template designed for immersive storytelling. The story map’s interactive format allows viewers to explore the data and analysis on their own terms and get personalized information about the places that matter to them.